As a child, I hated throwing away the eggs I worked so hard to decorate. My problems were solved one day when I saw a documentary at school that included blowing eggs! I headed straight home to try it, with the blue eggs from Uncle Ed's chickens. 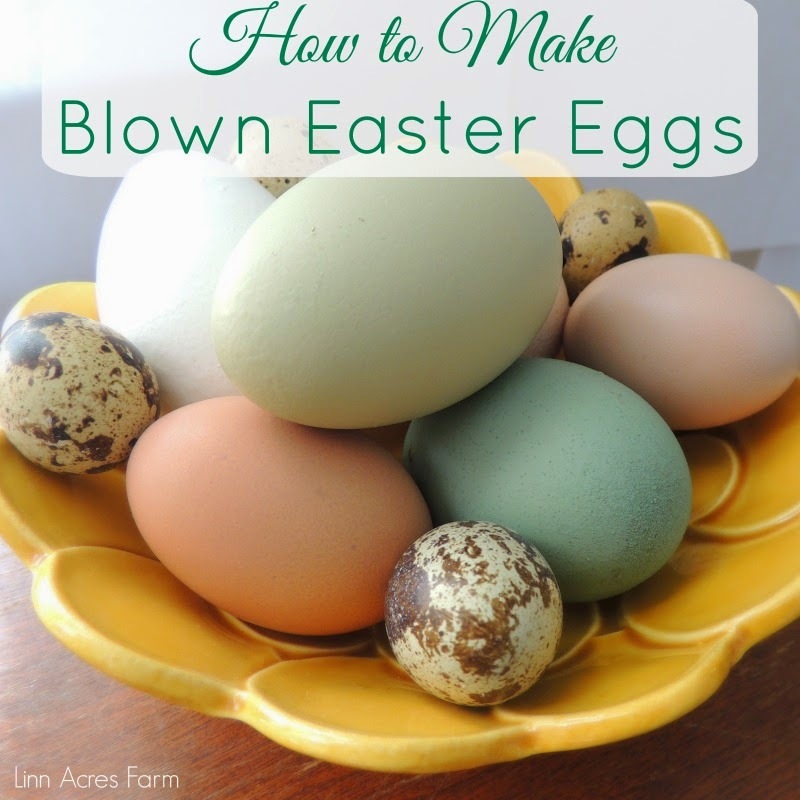 Since then, I have always loved making blown eggs! They are a fun craft to do around Easter that allows you to save your decorations for years to come. This is a great project for kids, since they can decorate their eggs afterwards and save them for as long as they wish. If you raise your own chickens, especially Easter Egger chickens that lay multicolored eggs, you will definitely enjoy making these! There are two ways you can blow eggs: manually using just the air from your own lungs, or using an egg blowing tool. Both methods are simple and easy and both result in the same empty egg. But no doubt about it, the egg blowing tool is faster. If you'd like to dye your eggs, I suggest dying them after blowing out their contents, as to not disturb the decorations on the eggs. To blow eggs without using a tool, first wash off your eggs well. Once you dry them off you're ready to begin by poking the holes. To do this easily, use a thin nail. You want the holes to be small enough that they are not noticeable, but want to avoid accidentally cracking or breaking your egg. Begin by making your hole on the pointy end of the egg by placing the nail firmly against the shell. Rock the nail back and forth gently as you slowly apply more and more pressure.The nail should push through the surface of the shell. Repeat this step on the other wider end of the egg. Once you have both holes in place, grab a toothpick. Slide it in through one of the ends and scramble the egg up inside. You want to be sure to completely scramble the yolk, otherwise the task of emptying the egg will quite a bit more difficult. Now that the egg is scrambled, place your mouth over the hole on the wide end of the egg and begin to blow air in. The first few bits of egg are usually a bit more difficult to remove but once you get started it should come out pretty easily. If you're having trouble, scramble the egg contents with a toothpick once again. If you're not overly excited about placing your mouth directly against the eggshell, you can cut a small piece of straw to place over the hole. Be sure to keep the straw tightly up against the egg so the air travels into the egg. Once the egg is emptied, give it a rinse and place it in an egg carton or another safe place to fully dry out. To blow the egg using the egg blowing tool, all the items you need are included in the kit. There is a small tool to make the hole in the shell. Place this tool firmly against the eggshell with increasing pressure until it breaks through. If you are using the kit, only one hole is necessary, so choose whatever spot you like. Place the small tube over the end of the pump and inserted into the hole in the egg. Keep your thumb over the hole in the yellow pump, and begin to pump air into the egg. To make the egg empty more quickly, be sure to aim it downward.. gravity will help! Continue to pump until the egg has been emptied, changing the angle of the tube as needed. Using the pump you can even wash out the inside of the egg out further if you like. Fill the pump with a small amount of water, and squirt it back into the egg. Give the egg shake, then pump out the water. Rinse the egg and place it in an egg carton until it's fully dried. Now that your eggs are emptied and dry, it's time to decorate them! If you already have multicolored eggs, you may want to leave them as they are. Either way, they are beautiful. Feel free to dye them using your favorite method or even draw or paint on them. Once they are done, use them as Easter holiday decorations for as long as you wish! To store them from year to year, egg cartons work well and take up little space.